This post is written by my wife, Julie Piatt on the eve of our 7th wedding anniversary. It scares the hell out of me to post something so raw and vulnerable, but it touched me deeply. If you read this, one thing is for sure – you will glean some insight into why I love this most extraordinary woman. Based on the response to my last post “Time To Man Up”, I know there are a lot of people going through challenges similar to our own. My hope is that our choice to be so raw, open and exposed in a public forum may be of aid and comfort to others. In the silence of the early dawn, I am being gently nudged to write about my experience of being Rich Roll’s wife. After he posted his latest blog entry “Time to Man Up”, there has been a huge influx of emails from people around the globe saying “thank you for having the courage to speak” and adding, “I too have been going through a similar journey”. I feel now is the time for me to share my part in our very personal journey. Rich is an extraordinary being. He defies all normal logic and boundaries as he braves the path of being an endurance athlete. The most significant part of all of this is that he does it on a plant based diet getting faster and stronger as the weeks go by. He had transformed himself physically and now I can say that he has done the same spiritually. When he posted “ Time to Man Up”, he took the “red pill” so to speak, and exited the Matrix. Uh oh — ha ha. In July of 2010, CNN ran a piece on Rich from the perspective of a man turning 40, looking in the mirror and realizing he had lost the body of his youth. This event was the turning point for Rich embracing a vegan lifestyle and consequently becoming more fit than ever in his life. He completely transformed his body and raced in the double ironman “Ultraman” triathlon in 2009, finishing with a respectable 11th place. It was a great article that inspired many people. It was the most highly e-mailed article on all of CNN.com for a couple days, and was even a “trending topic” on Twitter. In fact, he still gets emails a year later referencing that article as the turning point for many others. All of this is and was amazing and powerful. It even caused a bit of a backlash — people assuming Rich’s exploits were made possible by wealth. But in my quiet moments, I had to laugh. I knew too well what we had lived through; the courage, the agony, the fear, sacrifice, judgment, hardships and the suffering endured not just by Rich but by our entire family during that period of time; challenges that have only continued to escalate other the last year — something I call “dismantling”. This journey was about much more than simple weight loss or even physical performance. The article had only slightly scratched the surface. “Dismantled” is a state where everything you thought you were starts to fall away. All of a sudden nothing seems to stick. You are doing everything you always had done in the past, and nothing works anymore. All your appliances and electronics start breaking. If a cop is in your vicinity, he is pulling you over. There are car accidents and bike crashes and literally your ivory tower is falling all around you. This can be a process that takes years. In our case, it’s been three years of this level of intensity — so far. Not to say that it is always at a fever pitch — it does ebb and flow like the tide. I liken it to being in the surf. You get hit by a wave; and just when you’re standing up and brushing yourself off, you get hit again and then again and again. This is part of the cleansing, the polishing of the diamond in the rough so to speak. You are being made “REAL”. The gift is that if you make it through, you become FREE. But it is not for the weary as it is very painful and uncomfortable. During this process, your friends and family think you are crazy, lazy or on drugs. They stay up at night fearful of what is happening to you. You are scaring them and threatening their reality and they want you to stop and go back to the way you were. The new age spiritual community thinks you are creating it, and conveniently label it as “bad” and believing that if you just say “ I think I can, I think I can, I think I can” a million times over, it will all just go away. This is not the case. TRUE, you did create it at a soul level. Your ego would have never agreed to it’s death. This is your sacred wake up process to the truth of your BEING. What Rich and I learned through this profound process was to become neutral observers. To have no resistance to WHAT IS. It was and continues to not be easy, but now it has become our spiritual practice. This applies to all events. One becomes unattached and non judgmental. The mind wants to leap on either one side or the other of every situation. “This is great!” Or, “This is awful!” But we found after observing many, many scenarios that most of it — “good” or “ bad” — is simply ILLUSION, or what in yoga is called “maya”. One thing for sure — It’s never what your mind thinks it is. As the spiritual warriors we have become, we must conserve our energy. We must take responsibility for our energy field and hold it in love and peace at all costs. How did we get here? Well the short story is that Rich and I met in yoga 12 years ago. We were married on our land at JAI on July 12, 2003. Our wedding was a spiritual world concert. 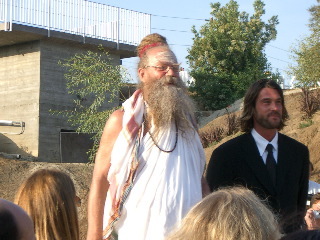 Bhagavan Das– the original “Be Here Now” yogi from the 70’s and compatriot of Timothy Leary & Ram Das — performed the ceremony & kirtan, a form of musical chanting in Sanskrit (Bhagavan has a kirtan album produced by Mike D of the Beastie Boys). He was joined by a wide array of channelers, healers, African wedding dancers and gospel singers — all of whom took part in our beautiful ceremony. It was BEAUTIFUL! And it is still one of the most amazing days I have ever experienced in my lifetime. At the time, I had formed a company called JAI Lifestyle. It embodied international yoga retreats in Tuscany, cutting edge Italian interior design, community around a tipi called JAI Tribe, and a clothing line with guru images and spiritual sayings. Meanwhile, Rich was practicing law and it wasn’t really working that well. He didn’t like it and it really went against the grain of every feeling he has in his body. But he is scary smart and a brilliant writer with his Ivy league education — Stanford and then Cornell Law. So he can churn out the contracts and do it well. There were many meetings between us where I would beg him to come work with me at JAI Lifestyle. At that time, I thought we could do it together, that it would be great. But he wouldn’t come. I think I may have convinced him once for about a week but it soon dissipated. We had a lot of ambition back then. Actually I had more than Rich did. Truthfully, I had enough ambition for 29 people. I was in the illusion that it was all for good. Yoga, healing the planet, blah blah, blah…I wanted to start doing retreats at JAI. At one point I had the tipis ready with cots and heaters. But no one came. Now I understand that in order to be the pure healing channel that I truly wanted in my heart that there yet remained much clearing to do. Rich and I also had a lot of competition between us My overworking ambition was annoying to him in some ways. While he did love me for my visionary qualities, he really wanted to “make” his way in his own right — apart from me. I would beg Rich to paint. I still maintain that if he starts, he will be better than I am. He is an amazing natural artist, a great writer and director. And he is a great coach and speaker. What happened next is that my interior design career took off and I started working as the American agent for an Italian supplier of the finest furniture and fixtures based in Florence. I worked closely with Lorcan O’Herlihy, the architect of JAI house, who I adore and share a deep friendship with. It was cool and it paid really well. Rich and I had written a script together so we decided to make a short of that movie and try to use it to sell the feature script. We spent close to $50k of our own money and everyone worked for free. We had tons of support from our community. I think we had 100 people on our set. We filmed part of it at our JAI house. By this time, JAI House had become the most photographed house in this decade. AIA “House of the Year”, she was a star In both architecture and fashion, gracing covers from Italian Vogue to Architectural Record, with profiles in the LA Times, Los Angeles Magazine, Oprah Home and many many more. Down Dog, the titile of our movie, is a satire on the West L. A. yoga scene. Filming it was a beautiful example of how well Rich and I work together. I gave birth to Mathis, our now 6 year old, the day after we wrapped filming. We dropped the film off at Universal and went right to Cedars Sinai Hospital. Mathis was born that day at 5:40pm. The short film did fairly well. We won “Best Short Film” at a few noticeable film festivals and screened at over 20 film festivals worldwide between 2004 and 2005. It had taken Rich 3 months to edit. We only shot three days and he needed more. So he had to sit with one very patient, generous and talented editor day after day until they got it right. Sometime after that, we decided that Rich would re-write the feature script and we would be supported by my interior design along with location shooting which we did here on average 2x per month. And he would practice some law as he could and pitch in. Rich finally finished the script along with a new writing partner and for one moment we thought we had a real movie set up in Hollywood. We had meetings with a variety of big production companies & producers. At one point, we even had a big star attached. It was that moment where we all could see our five years plus of hard work had paid off. But nah, that isn’t what happened. The movie fell through and we started to experience the crash of the Ivory tower instead! Yeah for us! I have always been the kind of woman that believed in living your dreams, of taking risks and developing your own song. But at that time, I was frustrated with Rich’s struggles, his alcoholic behaviors, and really, his inability to “Man Up”. I tried everything. I was cheerleader, begger, rationalizer, reasoner, aggressor — you name it, I tried it all and still he was not moving closer to me or JAI. It was as if when I got energized, he became paralyzed. I spent hours speaking to a few close friends both male and female, all of whom told me how “right” I was. But being “right” wasn’t helping us. Finally things hit a bottom and I asked Rich to leave. It was a February I think, maybe Mathis was a year old? He was gone only a day. During that long moment, I realized that I wanted to be with this man. I did not want to be with anyone else and of that I was certain. Lucky for me, he felt the same way. I started meditating. I turned the focus inside. Instead of looking at all he was doing, or not doing, being or not being. I started looking where all real truth lies, Within. Divine Love is realizing that ALL IS GOD. I realized that Rich is God and that if he was the one that was standing beside me, then this is divine. So I began loving just Rich exactly as he was, exactly as God presented him to me. I loved him drinking his venti plus three add shot Starbucks. I loved him and his alcoholic mood swings. I loved him as he was eating burgers and fries and watching violent movies. I dropped my need for him to be anything other than who he was. I accepted and embraced that he may not choose a spiritual path or want to work with me and that it was all ok. I recognized that It was his life to live. And even with the differences between us, I still loved him and could be in a relationship with him. He had many lovely qualities as well. We really enjoyed life together. 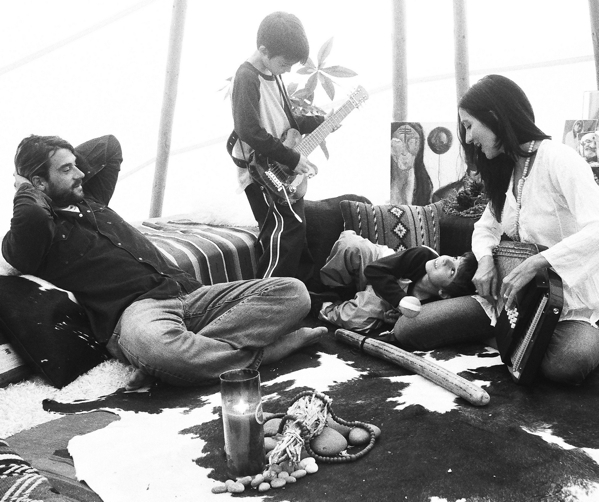 He is an amazing Father and he has such a beautiful intuition. We have always had a creativity between us that lets us experience each other in new ways even after 12 years. We laugh so much together. The truth is that Rich has had my heart always. He immediately could feel this energy shift. He would come to me apologetic for certain behaviors or situations and I would say, “no it’s okay, don’t apologize just please be who you are.” My head was bruised from banging it against the wall. But I had finally gotten it. Months passed and one day Rich asked me to get him some herbs as he wanted to do a cleanse. I said, semi surprised, “ok”, I agreed that I would get him some. But my body didn’t move. I can’t explain it. It’s not like I thought it in my mind, but it was not arising. In another week, he asked again and I again said I would get him set, but my body didn’t move again. By the time I got him the herbs, he was pretty irritated by my noncompliance. It was new to him. In the past, I would have run out and personally spoon-fed them to him. Even as he began to cleanse, I was only watching in observation. I had no thought or attachment to how long he would last. And I certainly had no clue that after a couple months he would emerge a vegan and start braving double ironmans or like five ironmans in a row in under a week! I remember watching him the first day with detached wonder — he seriously looked like he was coming off heroin. This was the moment, the beginning of Rich finding his heart. It has been a grueling three years. Sometimes, I feel as if I have been dragged down a long stretch of road. It has been a time of mostly seclusion for me from much outside my kids and Rich. I did write and record an album, had my first gallery art show of my tree photographs, managed two planetary healing trips — one to Damanhur in Italy and one to Arunachala in India. We welcomed the arrival of our 4th child, Jaya who is now 3. So it’s not like nothing happened of course. But day to day, I have spent many many hours in this beloved house, just watching the moments and feeling this new energy. Through this process, I have become a singer/songwriter. Rich has become an Ultra-althlete. Both of us have found our hearts song in nature’s play. Rich wanted to train and race. He needed it. It was his heart. So I told him to train first, kids and me second, and law third. He would look at me tortured and guilty for leaving me so many long hours and for not trying to fix it all by practicing more law. I would tell him to go and train, pushing him out the door. And then I would create vegan recipes to nourish his body when he came home. Shockingly after his long training hours, he was able to come home and take the girls and clean the house and actually show up. I would go out or work on my music or take a break. And then he would leave again and work until 2 in the morning. The truth is, he was more efficient than ever because he was being true to his soul. This is how we made it over the past three years. My interior design career ended with the birth of Jaya three years ago. It was just over. I can’t explain it but got this message that clearly told me, “no more”. I am to be the musician, artist and healer that I was designed to be. Now Rich is standing at the same threshold with his law practice. I said to him, “We are here hanging onto this life raft called “law””. We are floating here with the illusion that we need to hang on tight. We have children to feed and we have to survive in this world. But it is just that, an illusion. Is our mortgage paid? No. Do we have food? No. Is your law practice providing that security we seek? It is a false security. The truth is that God is our source and we need to serve that force in the very specific way we were created. He said “Everytime I see Mathis’ horseback riding boots and water bottle ready for her lessons, it kills me. Trapper shouldn’t have to buy groceries with his birthday money, Tyler shouldn’t have to go to school without a proper nutritious lunch.“ I should be providing for the children better than I am.” I replied, “Trapper was so proud to give it to me, he hugged me and the moment was so powerful. Tyler never complained that he had no lunch, he instead thanked me for feeding him breakfast. The example of courage, pure heart and truth that you provide them every moment that you choose to be true to your soul, is worth more than anything material you could give them. YOU INSPIRE THEM! What will our life be like? We cannot be attached to it. We simply must do what we love, stay out of fear, and stay in our own boundary laser focused on who it is that we are. We see one possibility clearly, that JAI Lifestyle will be soon reborn and all that we dreamed in those early years will be brought to manifestation in now pure divine form, free of the ambition, competition and old structures governed by will and force of the old ways. That would be lovely indeed. In deep love and respect for all life.